One of the world's most significant fossil sites, the tar pits in central Los Angeles have revealed fossils of plant and animal life preserved in the pits for tens of thousands of years. The fossils themselves are on display in the Page Museum on the site, while replicas of some of the animals, mammoths and sabre-toothed cats found there have been creatively re-placed in and around the pits. 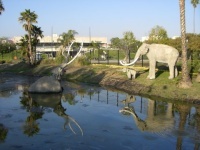 La Brea Tar Pits and museum also features interactive events, informative tours, exhibitions and 3D screenings. Opening times: 9:30am-5pm every day, excluding certain holidays. Admission: $15 (adults), $7 children; concessions available.